Can Augmented Reality Save the Printed Page? The future of books may be here. Augmented reality book Between Page and Screen is an innovative art project that seeks to renew the reading experience by combining the physicality of a printed book with the technology of Adobe Flash to create a virtual love story. To see the technology in action, you simply lay the 44-page hardcover across a laptop with a webcam and words will suddenly appear, spin and rattle. 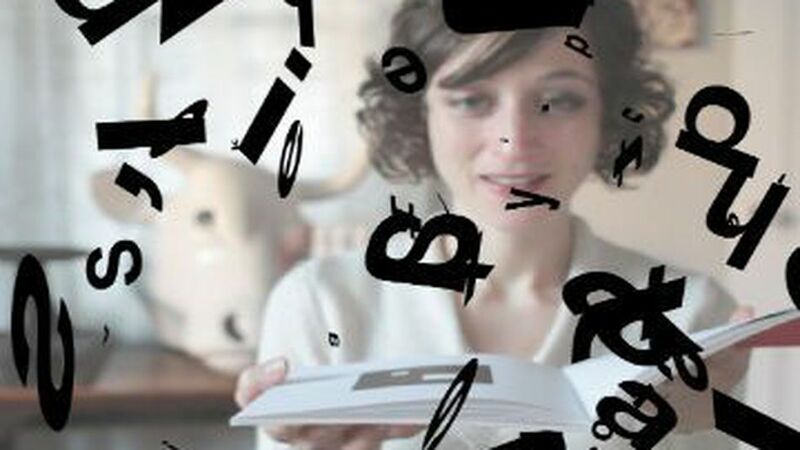 Turn the page to experience the wordless book of poems and see the future of interactive reading. Poet Amaranth Borsuk and developer Brad Bouse, creators of Between Page and Screen, started exploring augmented reality after seeing a business card developed with similar technology. A simple geometric pattern on the card once held up to a camera would turn up the card owner's face. Borsuk, whose background is in book art and writing, and Bouse, developing his own startup, were mesmerized by the technology. The married duo combined their separate love of writing and technology to create this augmented reality art project that would explore the relationship between handmade books and digital spaces. The book is full of wordplay between the characters P and S. Expect a lot of movement and the fun of a pop-up book designed for adults. "It is actually pretty fun," said Bouse, who described seeing people experiencing augmented reality with a book for the first time. "Amaranth has been invited to do presentations. When she opens the book and people see the letters pop up [on screen] for the first time there's always a initial gasp." People shake the book, turn the page and appear to really enjoy the experience, said the authors. The book's animation, which helps propel the written love story along, was written in Flash. Between Page and Screen uses FLARToolKit to project images from book, using Robot Legs framework, 3D-effects of Papervision, BetweenAS3 animation and JibLib Flash. Any computer with a webcam can play the book, which will be published in April. However, the augmented reality book is ready for pre-order at SiglioPress.com. The authors created this book as an art project, but we're wondering if you'd be interested in a broader augmented reality book selection. Let us know in the comments.